Branding Oscar Wilde traces the development and perception of Wilde’s public persona and examines the impact of interpretations of his writing. Through calculated behavior, provocative language, and arresting dress, Wilde self-consciously created a brand initially recognized by family and friends, then by the British public, and ultimately by large audiences over the world. That brand changed over the course of his public career—both in the way Wilde projected it and in the way it was perceived. Comprehending the fundamental elements of the Wilde brand and following its evolution are integral to a full understanding of his art. 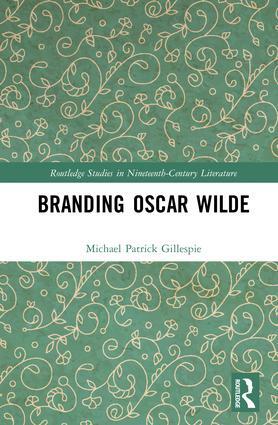 The study focuses on how branding established important assumptions about Wilde and his work in his own mind and in those of his readers, and it examines how each stage of brand development affected the immediate responses to Wilde’s writings and, as it continued to evolve, progressively shaped our understanding of the Wilde canon. After receiving his Ph.D. from the University of Wisconsin in 1980, Michael Patrick Gillespie taught for twenty-nine years at Marquette University as an Assistant, Associate, and a Full Professor and finally as the inaugural Louise Edna Goeden Professor of English. He has written a dozen books (on the works of James Joyce, Oscar Wilde, William Kennedy, Chaos Theory, and Irish Film) and two monographs. He has edited eight other works, including two volumes in the Norton Critical Edition of authors. He has also written over eighty articles and book chapters relating to English and Irish studies. He has been on the advisory boards of a half dozen scholarly journals, and has served as a reader for fourteen presses. He has received fellowships or grants from the National Endowment for the Humanities, the American Philosophical Society, the Humanities Research Center, the William Andrews Clark Library, the American Council of Learned Societies, the Wisconsin Humanities Council, and Marquette University. He has been named as a featured speaker in the Joseph Schick Lecture Series and gave one of the Lawrence McBride Memorial Lectures. He is the only American recipient of the Charles Fanning Medal for Distinguished Work in Irish Studies. He came to Florida International University in the fall of 2009 and currently serves there as a Professor of English having for five years directed the Center for the Humanities in an Urban Environment. He has been named a Distinguished Scholar by Florida International University, and is a STEM Institute Fellow. Gillespie has been on the Board of Trustees of the International James Joyce Foundation and on the Board of Consultants for the Zurich James Joyce Foundation. He has been Secretary, Vice-President, and President of the American Conference for Irish Studies.